In Upstate New York, architect Elaine Monchak's contemporary kitchen design animates the old bones of a 1789 farmhouse. If undertaking a home improvement project can take a lot of courage, the buyer of this 1789-vintage farmhouse in Chatham, NY, must have an abundance of the right stuff. When project architect Elaine Monchak first visited the house with her client, it was in “very, very bad shape,” she says. But the house’s location—far back from the road on several bucolic acres with lovely views in every direction—made the necessary upgrades seem worthwhile. Perhaps the greatest demonstration of valor was the decision to add a contemporary sunroom to the Colonial-style spread. “For a project like this, where you have a house with a very strong character and structure, there are really only two ways to go. You can do a building addition that fits into the same character or do something completely different,” says Monchak, principal of Monchak A+D Design LLC, in Hastings-on-Hudson, NY. The homeowner “is very sophisticated and appreciates modern architecture. 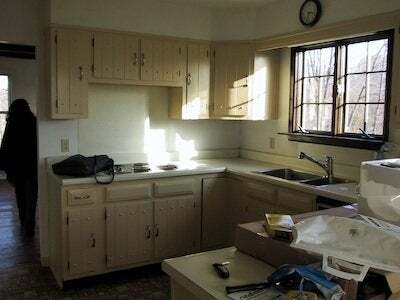 The decision was made early on to preserve the traditional character of the main house and use the kitchen as a transition to the contemporary addition. The kitchen is the ‘knuckle’ that holds the two together”. The warmth of wood under a white milk-tint rubbed finish nicely bridges the centuries. Enhancing the effect is the rift-sawn oak’s consistent tones and minimal knots, which produces a less traditional look than other cuts of this wood type. To maintain a light, airy, open feeling and make the most of the views, Monchak’s design nixed upper cabinets. Shelves in front of the windows and above the sink provide additional storage without adding bulk. 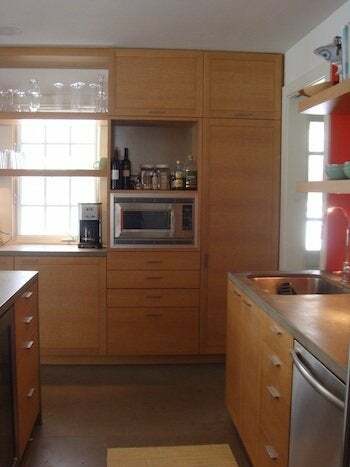 The tall cabinet next to the microwave maximizes efficiency with pull-out drawers (other built-ins include a trash/recycling center installed below the windows). This project is Monchak’s second for the homeowner; the first was a Manhattan apartment. For the Chatham house, the client was amenable to most of Monchak’s suggestions. As Monchak puts it, “She was confident in my abilities and let me do what I wanted”. But the client did have to be talked into the orange backsplash. “I wanted something bright as an accent,” Monchak says. “Everything else is neutral. This color picks up the oranges in the mahogany window frames, it complements the wood.” The seamless, easy-care backsplash was created from a single sheet of back-painted glass. The installation, however, was more complex than its gleaming simplicity may suggest. Durable tempered glass is too tough to cut to have accommodated the outlets or the shelves’ mounting hardware. So the holes had to be made before the glass was even tempered. The range hood was another topic of debate. The client, who enjoys cooking, insisted on one. Monchak resisted at first, reluctant to install anything overhead. “I did a lot of research to find one as unobtrusive as possible,” she says. The solution: a cylindrical stainless steel unit with a sculptural look that’s at home in its modern surroundings. The contemporary look of stainless steel is carried through in the mid-range appliances, which, chosen for looks and function, are more in scale with the modestly sized kitchen than pro-style models would be. Other metallic touches include the sink and faucet, the cabinet hardware, the under-island cabinet and the niche above the microwave. The sunroom sconces and ceiling fan continue the theme. The Fireslate countertop may look familiar to anyone who ever took a high school chemistry class. In fact, the manufactured slabs are so tough that they’re laboratory mainstays. Available in a variety of colors, Fireslate won’t crack, can handle high heat, and is lighter and less expensive than natural stone. However, oil, acidic foods, wine and even water will leave their mark. 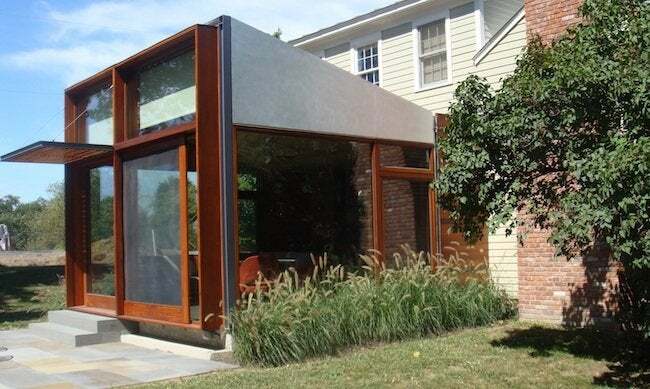 Over time, the material develops a patina that yields a casual, organic, contemporary vibe that many homeowners prize. Sliding doors—crafted of sandblasted glass and fiber-cement panels—separate the kitchen and sunroom, adding to the versatility of the space. The doors can be open for entertaining larger groups or closed to create separate intimate spaces. Even when the doors are shut, light filters through the translucent glass. Fiber-cement panels are used again on the floor; “It looks like concrete but is thinner and doesn’t crack,” says Monchak. The flow between kitchen and sunroom continues to a stone patio perfect for al fresco relaxing, dining, and entertaining, further fulfilling the original project goals of creating an attractive and functional space to share with friends. For some of the designer’s kitchen remodeling tips, click here. 1. Determine how you want to use your space and what you want to get out of the remodeling project. 2. Do you want your remodeled space to blend with the rest of the house or be something different? 3. Take natural light and views into consideration, as well as mechanical necessities like outlets, ventilation, and plumbing. 4. Take time to think through suggestions from your architect or designer. An idea that surprises today may delight in the long run. 5. Think about how much maintenance different materials and products require. Certain items (pro stoves without self-cleaning ovens, stain-prone countertops, polished surfaces that show every fingerprint) may not be appropriate for a low-maintenance space. 6. A door between the kitchen and family room can be a plus while entertaining. With the door open, the host can prep food and still join in the fun; during dinner, a closed door hides dirty dishes and makes it easier to relax and put the cleanup out of mind for a while. 7. Use glass tiles as a budget-wise way to replicate the look of back-painted glass.